This report is a sequel to our introductory report, which was received positively and supported by the community. Many thanks for your support. 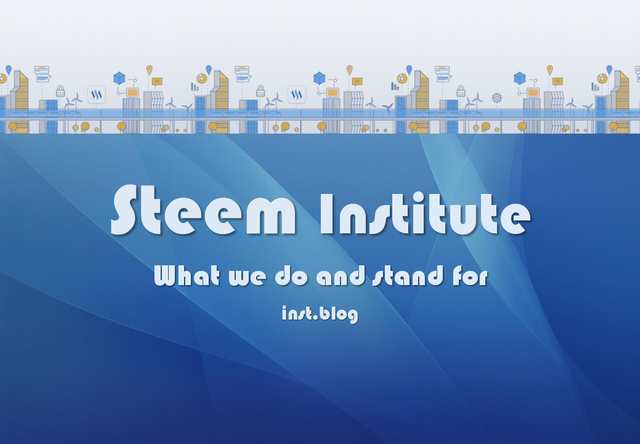 However, the concise nature of the report left some of our readers confused about the intended activities of the Steem Institute. In this brief report, I will outline what the Institute is to do and what it is to stand for. We intend to build solutions, opportunties, platforms, and communities on Steem for bloggers, businesses and investors. Our communities include a witness portal, developer portal, investors portal and national user portals. The services we will offer include monthly reports on the state of the chain, starter kit, exposition and discovery, perpetual content monetization network, mobile solutions and more. Provide migration and integrations support and services to websites, apps, and blogs which want to adopt the Steem technology into their systems. This will include support for creating new accounts, setting up SMTs, settings a witness account and more. For new and existing Steem ventures, we intend to provide support, promotion, financing, talent, consultation as well as a market. For the community we provide institution. A communal front to champion the cause of the community, chain development, promotion, and support. We are for everyone on Steem; investors, developers, witnesses, users, and entrepreneurs. We have aligned our vision and projects in such a way that we have something for everyone. The Institute's projects are all going to need all the developers we can get to build them, from interface developers to apps to the Blockchain developers. Lots of diverse opportunities for developers to maximize their potential. The Institute is a capitalist venture, with most of our projects to be incorporated as limited liability companies. In that light, our interests serve a common interest for businesses and entrepreneurs. Everything we build, we build for customers; the enthusiasts. They are the very reason we are building, and all we build is for them. Every project which can be open sourced without negatively affecting our work will be open sourced. All people in our teams will need to be people of integrity and with a good understanding of the Steem blockchain technology. We will provide healthy competition with existing competitor businesses and services, partnering with those who offer to. We cannot do any of these without the support of the Steem witnesses, Steemit Inc, Steem developers, investors, and community. We are open to them and will continue to work them every step of the way. Get in touch with and let us see how we can work together. Investors, developers, enthusiasts, and entrepreneurs are all welcome! These resources have not been fully developed, however, you could bookmark them. If you want to join our team, please visit our Discord channel. I upvoted your contribution because to my mind your post is at least 16 SBD worth and should receive 160 votes. It's now up to the lovely Steemit community to make this come true.